On October 9, Students for Justice in Palestine hosted a rally and teach-in at Parrish Hall to announce their new Boycott, Divestment, and Sanctions campaign at Swarthmore. SJP is calling on the college to divest from seven companies, including Caterpillar, Hyundai, and Hewlett-Packard, it believes are supporting and profiting from the Israeli settlement of disputed land. Within the campus community, there is some controversy over this movement, as there was last semester during SJP’s Sabra hummus protest. The on-campus BDS movement is an extension of SJP’s campaign last semester for a boycott of Sabra hummus. President Smith responded to the campaign by introducing an alternative hummus brand on campus, while keeping Sabra. Now, SJP is expanding its goals. BDS is a global movement that calls for boycotting, divesting, and imposing sanctions on specific companies in order to, according to their website, “[work] to end international support for Israel’s oppression of Palestinians and pressure Israel to comply with international law.” SJP’s BDS campaign is specifically targeting companies it believes are complicit in Israeli settlement of disputed land. It is calling for the college to divest from vehicle manufacturers Caterpillar and Hyundai and defense contractors Boeing, Elbit Systems, and Lockheed Martin, which do business with the Israeli Defense Forces, as well as Bank Hapoalim and technology company Hewlett-Packard. “I think the goal is more broadly is several things: get Israel to end the blockade on Gaza; get Israel to end its military occupation of the West Bank; and allow Palestinians the right of return, which they are guaranteed under international law,” Fouad Dakwar ’22, a member of SJP who spoke at the rally, said. According to another member of SJP, Zoe Jannuzi ’22, Swarthmore SJP members’ contact with other SJP chapters is limited to the Philadelphia area. However, their list of companies is modeled after those from the SJP chapter at Barnard College. These are not the only colleges across the country that have groups pushing for divestment. At Stanford, for example, the undergraduate senate passed a resolution in 2015 to divest from companies “identified as complicit in human rights abuses in Israel and Palestine.” Despite other instances where colleges have passed resolutions, no American college has ever divested as a result of the BDS movement. SJP highlighted Caterpillar as a company that has business both in Israel and the college itself. The company provides vehicles for the construction of the new BEP building, and according to Saul, it is also manufacturing vehicles used in the demolition of the village of Kahn al-Ahmar in the West Bank. Caterpillar has previously been targeted by BDS activists for providing vehicles to the Israeli Defense Forces. “[It] is the vehicles that is being used to destroy the Palestinian village of Khan al-Ahmar and other Palestinian homes. [These are] the same [type of] vehicles that are currently being used on our campus to construct our new academic building, and we think there’s a really strong disconnect there,” Saul said. Khan al-Ahmar has recently become a point of contention in the Israel-Palestine conflict due to Israel’s plan to demolish the village of 180 people. According to an article from The Washington Post, the possible demolition has been condemned by European countries at the UN, and if it does occur, it would be considered a war crime. Recently, Israeli president Benjamin Netanyahu has postponed the demolition to “negotiate a solution” with the residents. Despite the controversy surrounding the movement globally, SJP members feel that the BDS campaign at Swarthmore has been met with a largely positive response following the rally. However, according to Jewish Student Advisor Rabbi Michael Ramberg, who attended the rally, some students have privately expressed disagreement with the announcement of the BDS campaign, but do not feel comfortable expressing their opinions in public. Pushback on campus included a statement of condemnation of the Swarthmore BDS campaign from Swarthmore Students for Israel, which was posted on Facebook. According to the group, the BDS movement shuts down discourse and is antithetical to the college’s values. On a national level, other opposition toward the BDS movement has been incorporated in legislation that affects pro-BDS student organizations in colleges. In 2017, Congress introduced a bill called the Israel Anti-Boycott Act that declares that the US opposes “restrictive trade practices or boycotts fostered or imposed by an international governmental organization, or requests to impose such practices or boycotts, against Israel,” according to the bill’s summary. The bill is still in Congress. Also in 2017, the New York state Senate passed a law that withholds federal funds colleges from colleges that divest from Israel, as well as a bill that prohibits student groups from supporting BDS, which the law considers hate speech. 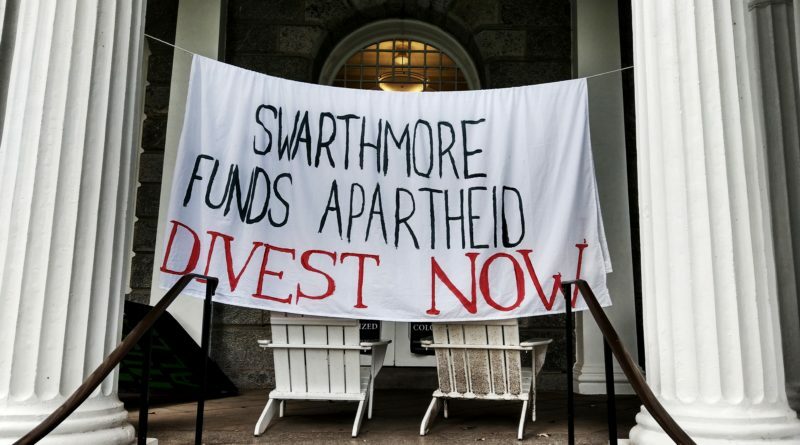 The Swarthmore administration has not yet responded specifically to SJP’s announcement. In a statement to The Phoenix, Vice President of Finance and Administration Greg Brown restated the board’s position against divestment for social objectives. The investment guideline in question states that the Board’s Investment Committee ought to manage the endowment so as to “yield the best long-term financial results, rather than to pursue other social objectives.” This guideline was implemented in 1991 after Swarthmore divested from apartheid South Africa. The board used the guideline as a justification for not divesting from fossil fuels in 2015, and reaffirmed this decision in 2017. Brown added that he hopes that there will be continued discourse on campus about BDS and other issues. Moving forward, SJP is trying to collect signatures for a petition and is encouraging students to attend their weekly meetings. Though student response appears to have a spectrum of responses, it remains to be seen how the college administration will respond to SJP’s activities. SJP is a hate group no different from the Westboro Baptist Church. If Swat is consistent about its values, it would show SJP and its ilk the door. Somehow, in taking a form of NON-VIOLENT action for Palestinian human rights (alongside the rights of all other marginalized people) after decades of military occupation and brutality against them, we are equated to hate groups.